Anna Myers and Billie Letts will be here with Molly Griffis on July 12th. Both are nationally known authors. Billie's "Where The Heart Is", was one of Ophra's Book of the Month Selections and then made into a movie. Anna writes for children: "Red Dirt Jessie" and "Graveyard Girl". 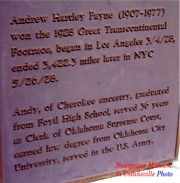 Andy Payne (his statue and plaque above at Foyil, OK) won the 1928 foot race along Route 66 from Los Angles to New York City. 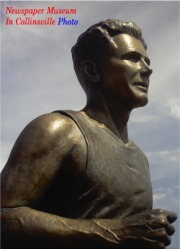 His story is the subject of the book: "The Great Bunion Derby" which will be signed by Oklahoma author, Molly Griffis, at the Collinsville Library 6:30-7:30pm July 12th. The book signing will be followed at 7:30 by a Concert on the Library Lawn. 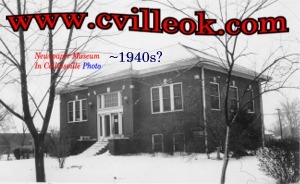 The Tulsa Community Band will provide the old fashioned concert music July 12.